It started with Monday. But it doesn’t end with Sunday. 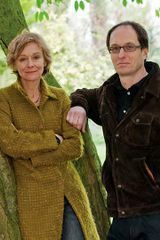 Read Sunday Silence, the new novel in the series that LOUISE PENNY calls “fabulous, unsettling, and riveting” and brace yourself for the breathtaking series finale in summer 2018. Lover of London, gifted psychologist, frequent police consultant Frieda Klein is many things. And now she’s a person of interest in a murder case. A body has been discovered in the most unlikely and horrifying of places: beneath the floorboards of Frieda’s house. I jumped into this series with this book, yes it’s the seventh book, but I have heard so many amazing things about it and I just know I’ll never have the time to start at the beginning so I figured this was the perfect opportunity to see what all the hype is about. 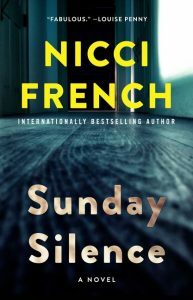 I can totally see why this is such a popular series, there is something unique and unconventional about Sunday Silence. I think it’s a combination of a few key ingredients, the main character is a psychologist and police consultant giving a fresh point of view and the pacing was unlike many other novels. Oftentimes thrillers/police procedurals are set over the course of just a few days, maybe a few weeks but this is spread out over a few months which made it seem so much more realistic to me. Just because the timeline was more stretched out doesn’t mean that the suspense is lacking, in fact it was very intense and the sense of danger was heavy throughout. This was a calculating read, both in terms of the storyline and the killer. This was deftly plotted, the authors are skilled at creating an elaborate labyrinth that I never managed to work out on my own. The cast of characters is eccentric and interesting and I can see how long time readers of the series would have an emotional attachment to them. If you’re already a fan, I think you’re in for a treat! If you’re a newbie like me I would recommend giving this a shot! Sunday Silence in three words: Cunning, Extraordinary and Shrewd. I was surprised to see that you’re a Nicci French newbie. I’ve seen her books everywhere but haven’t read any. I’m glad to hear you enjoyed this one. Ooh this one sounds really good! I’m glad to know it works even though you hadn’t read the previous books. Thanks for being a part of the tour!